Peripheral neuropathy is a widespread and potentially incapacitating pathological condition that encompasses more than 100 different forms and manifestations of nerve damage. The diverse pathogenesis of peripheral neuropathy affects autonomic, motor and/or sensory neurons, and the symptoms that typify the condition are abnormal cutaneous sensation, muscle dysfunction and, most notably, chronic pain. Chronic neuropathic pain is difficult to treat and is often characterized by either exaggerated responses to painful stimuli (hyperalgesia) or pain resulting from stimuli that would not normally provoke pain (allodynia). The objective of this review is to provide an overview of some pathways associated with the development of peripheral neuropathy and then discuss the benefits of exercise interventions. 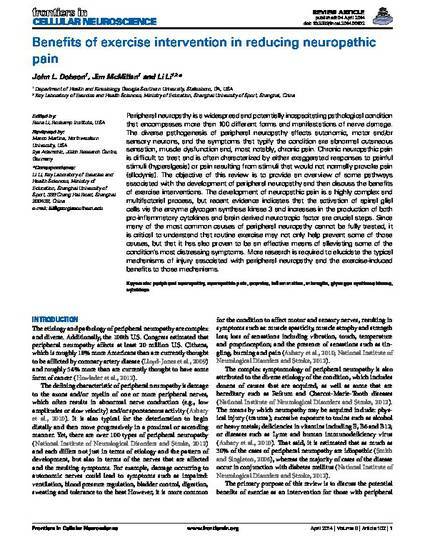 The development of neuropathic pain is a highly complex and multifactorial process, but recent evidence indicates that the activation of spinal glial cells via the enzyme glycogen synthase kinase 3 and increases in the production of both pro-inflammatory cytokines and brain derived neurotropic factor are crucial steps. Since many of the most common causes of peripheral neuropathy cannot be fully treated, it is critical to understand that routine exercise may not only help prevent some of those causes, but that it has also proven to be an effective means of alleviating some of the condition’s most distressing symptoms. More research is required to elucidate the typical mechanisms of injury associated with peripheral neuropathy and the exercise-induced benefits to those mechanisms. © 2014 Dobson, McMillan and Li. This is an open-access article distributed under the terms of the Creative Commons Attribution License (CC BY). The use, distribution or reproduction in other forums is permitted, provided the original author(s) or licensor are credited and that the original publication in this journal is cited, in accordance with accepted academic practice. No use, distribution or reproduction is permitted which does not comply with these terms. Article obtained from the Frontiers in Cellular Neuroscience.